Every time I grill pork chops, I ask myself, why don’t I grill them more often? Admittedly, when I peruse the meat counter at my butcher, my eye is immediately drawn to red meat. I suppose it’s a habit I need to break, as a thick cut, highly seasoned, properly cooked, this pork chop can easily match a good steak. The key words are “thick cut, highly seasoned, & properly cooked.” The pork of my youth was often overcooked and bland, not the fault of the preparer, but of the times. Historically, pork was cooked to an internal temperature of 160°F to ward off disease, like Trichinosis. However, thanks to modern practices, many disease threats have been eliminated allowing pork to be cooked to a much more enjoyable 145°F. Thank you, science, my taste buds are quite pleased. Properly cooked and thick cut goes hand in hand, as a larger cut is easier to manage. Thin cuts of pork can cook fast making it hard to hit, and then miss, the target temp. For ease and taste, a thick chunk of pork is where to go. Finally, the seasoning. Pork can taste great with minimal seasoning, but it shines with an aggressive rub. Its tender flesh is the perfect complement to a bevy of sweet, spicy, and earthy spices. Pile them on. Speaking of pork excellence, look no further than this great recipe from Jamie Purviance. It hits all the right notes, thick cut pork chops, a super aggressive and equally tasty spice paste and for an added plus, a tangy buttermilk carrot slaw. It’s a recipe where it all comes together and more importantly, makes me look away from the butcher’s lines of red meat. 1. In a small bowl mix the salt, pepper, paprika, onion powder, chile powder, oregano, cayenne, and garlic powder. Set aside 1 teaspoon of the spices for the slaw. Add the oil and vinegar to the bowl and stir to combine. 2. Spread the paste on both sides of each pork chop. Cover and refrigerate for 2 to 6 hours. 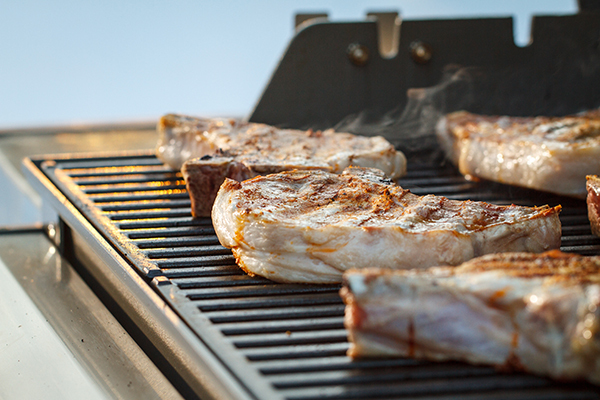 Allow the chops to stand at room temperature for 15 to 30 minutes before grilling. 4. Prepare the grill for direct cooking over medium heat (350° to 450°F). 5. Grill the pork chops over direct medium heat, with the lid closed, until still slightly pink in the center, 8 to 10 minutes, turning once. Remove from the grill and let rest for 3 to 5 minutes. Serve warm with the slaw. Nothin’ Better than a Burger!